Marking the start of a brand new series of releases for Monika, City Splits Vol.1 runs in parallel with the label's popular 4 Women No Cry compilations, but rather than collecting artists from different parts of the globe, this series draws together talents from the same city, united under the billing of being two of that city's most exciting burgeoning talents. "Having recently celebrated the 20th anniversary of reunification and the fall of the Wall, Berlin was a logical choice for the 1st installment of City Splits: #1 presents two interesting female musician-producers who live and work in the German capital. 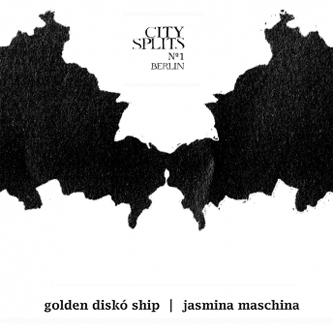 What Golden Diskó Ship and Jasmina Maschina have in common, other than the fact that they tour as a double-bill each not only supporting but playing on stage with the other, is their standing in the Berlin scene. Despite their very different musical styles they both have strong followings certainly in their home towns and, looking at their relentless tour-schedule, presumably from further a field too."